Adblock Plus already blocks all Facebook ads, including sponsored stories, page post ads, standard ads, promoted posts, and so on. Starting today however, the service is taking its blocking powers even further. Adblock Plus offers you three options: block all annoyances, block only News Feed annoyances, or block only sidebar annoyances. If you have the extension installed, you can pick one here. Music Pages You May Like. Entertainment Pages You May Like. Rate To Add To Your Movies. Rate To Add To Your TV Shows. Rate TV Shows You’ve Watched. This is a big move by Adblock Plus. Blocking ads on Facebook is already a big hit to the social network’s bottom line. Now the company is attempting to modify the service’s experience. 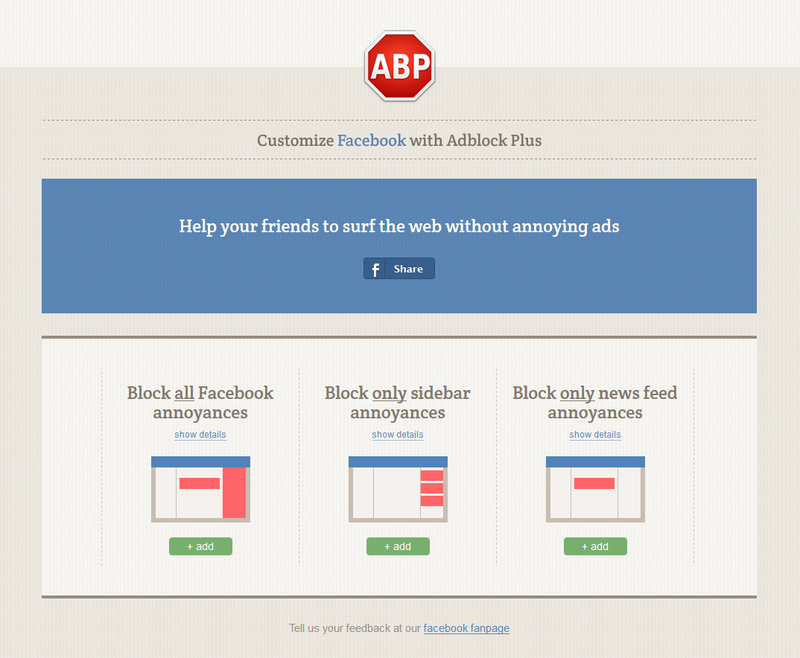 Maybe Adblock Plus simply wants to get Facebook’s attention. The company already tried with Twitter, and that didn’t work, so why not poke Facebook? We’ll be watching closely to see if Facebook pokes back.